While the Daily Show brilliantly reminded millions of viewers last night of the disgraceful racist elements behind the attack on Tucson's acclaimed and now outlawed Mexican American Studies program, educators across the nation recalled a teaching moment. Over a half century ago, facing a similar segregationist campaign to shut down the Highlander Folk School in Tennessee, famous for its pioneering desegregation and civil rights efforts, folk school co-founder Myles Horton informed his rabid foes: "A school is an idea, and you can't padlock an idea." Invoking Horton's towering legacy today, the Zinn Education Project bestowed its national Myles Horton Education Award on embattled Mexican American Studies director Sean Arce for his leadership role in "one of the most significant and successful public school initiatives on the teaching of history in the U.S."
"Tucson's Mexican American Studies program gets it absolutely right: Ground the curriculum in students' lives, teach about what matters in the world, respect students as intellectuals, and help students imagine themselves as promoters of justice," Zinn Education Project co-director Bill Bigelow said in the press release. "I'm thrilled that the Zinn Education Project is able to honor the work of Sean Arce by recognizing him with the first Myles Horton Award for Teaching People's History. Mr. Arce has begun work that we hope will be emulated by school districts throughout the United States." "The Mexican American Studies program in TUSD has been a resounding academic success and affirmation of the diversity of our nation and our community," said U.S. Rep. Raúl M. Grijalva (AZ-07), who represents the Tucson area. "Sean Arce, as a teacher and as director of MAS, has been key to the success of the program and to the very necessary ongoing effort to save it. He has helped lead the program to a standard of excellence that we all continue to admire, and he will help lead it back to that same standard when these politically motivated attacks on students and education are just a bad memory." Named for Horton, one of the most influential educators in the 20th century and co-founder of Highlander Folk School in Tennessee, legendary for its pivotal role in desegregation, the national award honors those who "promote democracy through education by ensuring that students have the knowledge and skills to be informed and active participants in their communities, country, and the world." Renowned scholars and educators applauded the Zinn Education Project's recipient. Christine Sleeter, President of the National Association for Multicultural Education, called Arce a "steadfast pillar of an outstanding program that was unlike what he had access to as a student." She added: "Under his co-leadership, more than 6,000 students, the majority being Latino, have been served by a program producing a consistent graduation rate of more than 90 percent, at a time and in a state in which Latino students complete school at a much lower rate. His work and accomplishments on behalf of social justice for Arizona's youth merit the highest tribute." 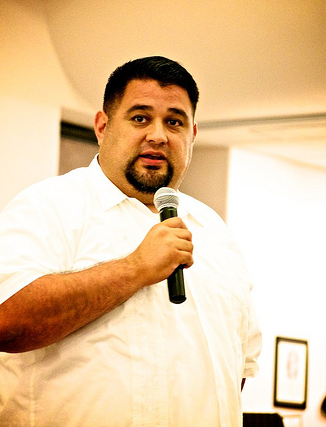 At a time when students, particularly students of color, are accused of being apathetic about education, Sean Arce, a teacher and director of the Ethnic Studies program of the Tucson Unified School District, refutes this claim loudly and beautifully. Given the widespread mean-spirited and false attacks on the program from right-wing politicians who have resisted even visiting the program, Sean Arce stands out as an educator who speaks truth to power. He has inspired young people to love, to pursue their dreams, and to work for the betterment and uplift of their communities. As one young man in the film Precious Knowledge so beautifully said, 'This space saved me.' Sean Arce's work is a welcome antidote to the cynicism about young people and a testament to the power of education. Founded with the support of revered historian Howard Zinn, author of the phenomenal bestselling A People's History of the United States, the project works with 20,000 teachers from every state "to introduce students to a more accurate, complex, and engaging understanding of U.S. history than is found in traditional textbooks and curricula." "As co-founder and director of the MAS program," ZInn's daughter Myla Kabat-Zinn said, "Sean Arce developed a culturally relevant program that speaks to students who have felt unseen and marginalized and inspired and motivated them in their education, to know their own history, engage actively in their own learning, and connect in meaningful ways to the larger community. I applaud the Zinn Education Project for honoring this dedicated educator committed to promoting the study and understanding of issues of social justice."